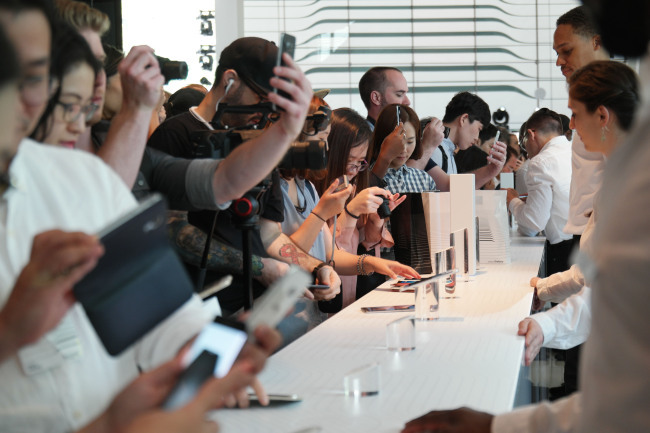 [THE INVESTOR] NEW YORK -- When Samsung Electronics first launched the Galaxy S6 Edge featuring a curved display in 2015, it caught the eyes of many thanks to its stunning, unprecedented design. However, Samsung fell short of gaining traction in sales as it failed to catch up with the demand for the S7 Edge due to glitches in producing the display curved on both sides. Now having achieved a rather satisfactory level of production yields for the Edge display, Samsung said it would put more focus on smartphone models with the curved display in the future, hinting it could eventually eliminate the flat-screen Galaxy S model down the road. “Samsung has considered that it would make the edge display as the identity of the Galaxy S smartphone lineup if the company can provide consumers differentiated user experience through software and user-friendly functions (for the curved screen),” said Koh Dong-jin, the head of the tech giant’s mobile business, in a media interview in New York last week. It takes no rocket scientist to assume the Galaxy Note 7, a curved-screen large-size smartphone unveiled last week, will serve as a touchstone for Samsung to decide to roll out a single model with a curved screen for future Samsung flagships, including the Galaxy S8, which will be released next year. Since 2015, Samsung has rolled out its flagship smartphone along with an Edge variant -- the Galaxy S6 and S7 came with the S6 Edge and S7 Edge, respectively. The tech giant, however, recently unveiled the Note 7 featuring the curved display without the Edge name for the first time. Samsung said it saw the sales of the Galaxy S7 Edge, released in February, exceed those of its flat-screen sibling. “Samsung will not likely get rid of the flat-screen Galaxy S smartphone model right away, but if the market response is positive with the Note 7, it would surely serve as a cue for Samsung to focus only on the Edge model,” a market watcher said.